Unique opportunity to purchase an established charter boat business in Belize, which under existing regulations would be prohibitively expensive to reproduce. 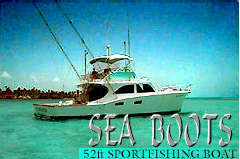 "Sea Boots" is a charter boat business established in Belize since July, 1991. This charter boat has had a variety of profitable charters over the years including: deep-sea sport fishing, sunset cocktail cruises, weddings, dinner cruises, and trips through out coastal Belize, as well as week to ten day charter trips to Honduras and Guatemala. "Sea Boots" has also been an active participant in local fishing tournaments, winning an assortment of trophies. This business has a broad-base support of clients ranging from individuals to international travel wholesalers and agents. This charter boat has been booked, at one-time or another, by almost every hotel and agent on Ambergris Caye. Agents and hotels from Belize City also book charters with "Sea Boots" . "Sea Boots" is a 52 foot Flybridge Sportfisherman. It has a very roomy 16 foot beam with open saloon. The boat was build in 1972 by Padilla in Miami, FL. and was designed by Lee Wallard/Norseman. She was purchase from "Buddy" Cary which ran a charter boat fishing service for over 50 years in Miami, FL.. He had the boat designed specifically for "day charters". It has a fiberglass hull and is powered by two Cummins VT8-370 turbo charged diesel engines. Before coming to Belize, all equipment was updated. This offer includes, not only items on the boat, but also an assortment of valuable spare parts, fishing tackle, ice machine, freezer, and much more. I invite you to come see "Sea Boots" and explore this unique business opportunity in Belize. These item are being offered for sale by, Sea Boots Inc. Limited . The charter boat "Sea Boots" and the business is being offered for sale by Sea Boots Inc. Limited for $218,000.US. The buyer is responsible for all fees and taxes required.